This is very famous dish , actually so many delicious indonesian food, but i don't know why this is more popular, perhaps its easy to make. 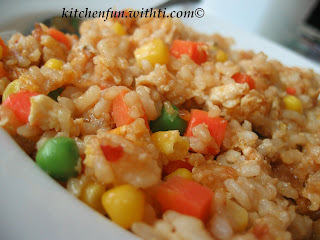 When topped with egg, its "special" fried rice. Heat 2 teaspoons of oil in a wok or frying pan over high heat. Add the chicken and stir-fry for 2 minutes or until cooked. Transfer to a plate. Heat the remaining oil in the wok. Add the sambal oelek, garlic and the white sections of the shallot and stir-fry for 1 minute or until aromatic. Add the chicken, rice, kecap manis and the green sections of the shallot(or frozen veg). 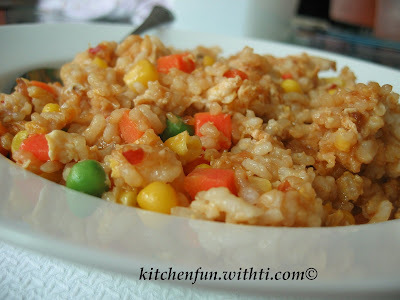 Stir-fry for 2-3 minutes or until well combined and the rice is heated through. Divide among serving dishes. Add enough oil to the wok or frying pan to grease. Crack 1 egg into the wok. Cook for 1-2 minutes or until the white sets and the yolk is almost set or until cooked to your liking. Transfer to a plate. Repeat with the remaining egg, reheating the wok between batches. Place the fried eggs on the nasi goreng and top with cucumber. Tip: If you're not in a hurry, for the most authentic result, cook the rice a day ahead, spread it over a shallow dish and store, uncovered, in the fridge overnight. This prevents the rice sticking together in the wok. Here in belgium this is a famous dish as we are near to Holland and they have a large indonesian community. Happycook: Happy New year to you too! yes i know, because i have some indonesian friends there.